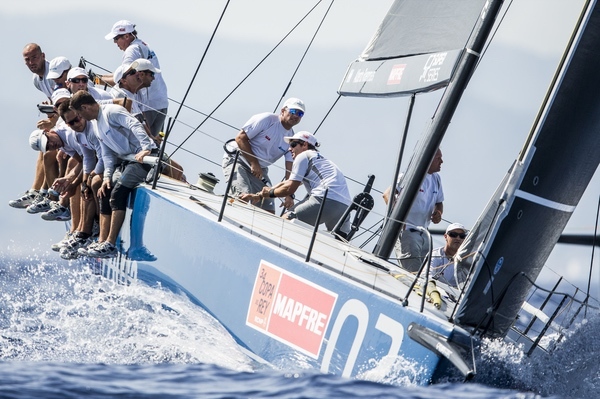 Azzurra made the best possible start to their 34th Copa del Rey Mapfre defence with two straight wins on the Bay of Palma capitalising on two strong starts to lead at each and every mark today. 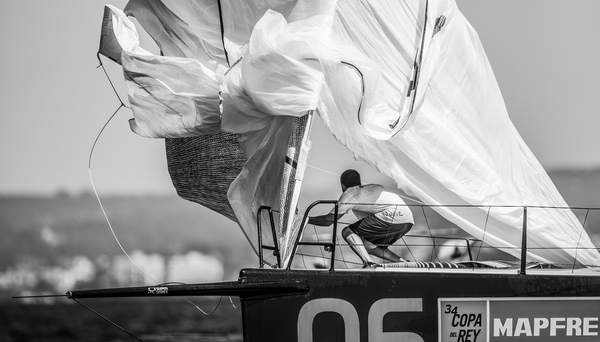 The crew which won the world championships last month on the same waters earn themselves a lead of two points over Andy Soriano’s Alegre. Having changed tactician to double 470 world champions Nic Asher, Alegre sailed smart and fast to post two second places. With Dalton DeVos steering, Quantum Racing could have had two clear third places other than for the last gasp arrival of Platoon on the finish line of the second race. 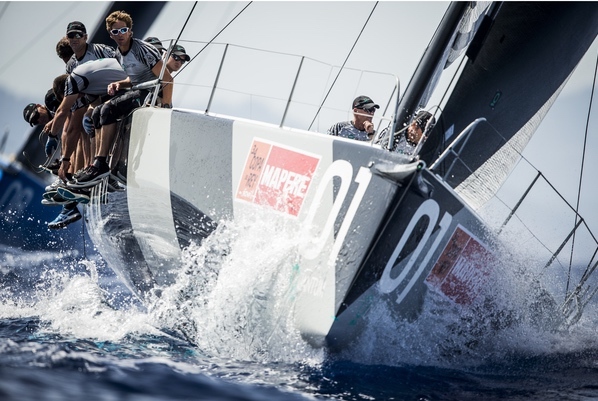 As it stand the two were judged to have been a dead heat and so share the points, but Quantum Racing finish the day within their own 7 point target aggregate for the day. 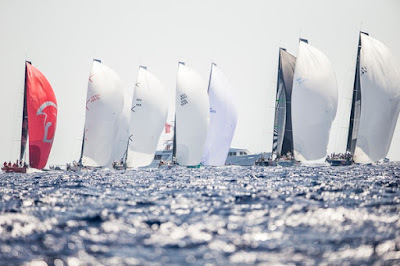 If the Copa del Rey race arena is too often portrayed as one dimensional, one sided then the first race rather disproved that theory when a cloud came over and sent the breeze swinging around, leaving light patches and some useful windshifts. 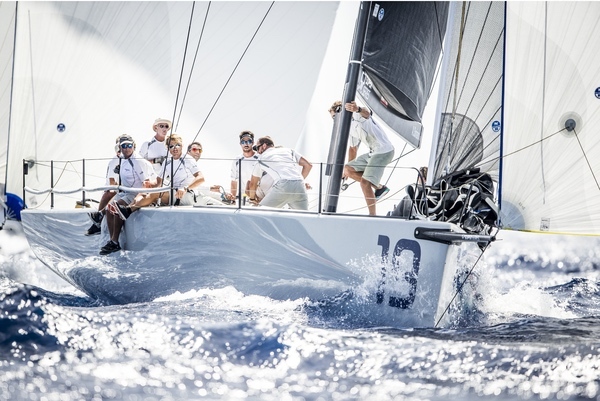 But to their credit the race for first place was over after Guillermo Parada executed a great pin end start on the helm of Azzurra. They had followed the traditional ‘go left’ maxim which proved the springboard for a healthy early lead. Alegre made a nice gain down the first run when the breeze wavered, and caught up to go around the leeward gate bow-to-bow with Azzurra. But by the top mark Azzurra were clear ahead again with a lead they held to the finish. Harm Müller Spreer’s Platoon were second at the first mark but were penalised for crossing too close to Provezza. Their turns cost them four places while Quantum Racing held a good third place across the finish line. The sea breeze had built for the second race, topping 15 knots at times, and the Bay of Palma delivered the conditions for which it is renowned around the world. Gladiator made the best start off the pin end of the line but Azzurra prevailed with the better layline in from the left. 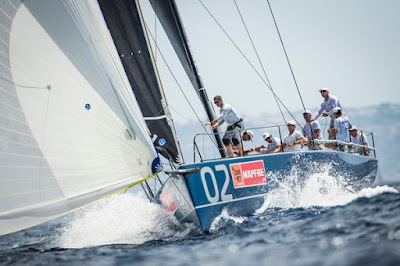 Alegre stayed clear of the four cornered battle on the left flank and were able to round the top mark second, close to Azzurra. Platoon made a good recovery after a modest start and kept pushing right to the finish line, only just pipping Quantum Racing for third. 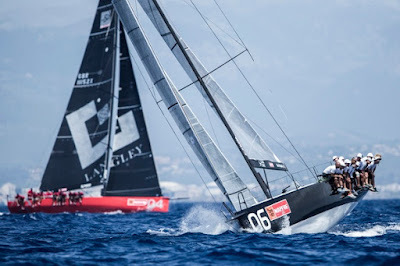 The two boats share the same time to the second, but the race officer is clear that Platoon, coming from behind, had done enough for third. “Guillermo did a great job with two very good starts. Thereafter everybody more or less did the same course but we had the better starts, that makes it easier for me. 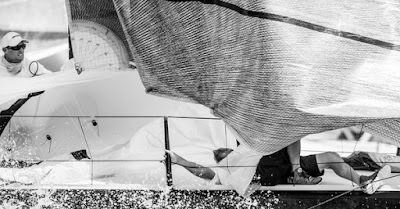 The boat is fast. I hope we can maintain these good results. I think we made some great work with the research in the set up of the mast and sails,” said Azzurra's tactician Vasco Vascotto. 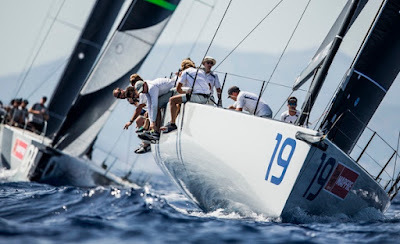 For their first day in the 52 Super Series fleet with Spookie, the former Interlodge, Olympic silver medalist Steve Benjamin and crew found the competition tough, as tactician Peter Holmberg noted of their 7,10 opening.